The First Step You Need to Take To Conquer Your Debt | Good Life. Better. I know what you’re thinking. Based on the title of this article, you expect a post that delivers yet another lecture on creating a budget, right? That tells you that to conquer debt, all you need to do is calculate the income versus spending math, right? 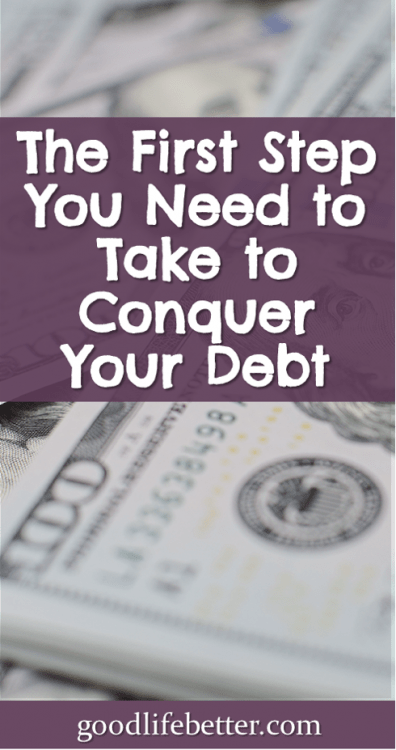 Well, the truth is that while all those things are important, the very first step you need to take to conquer your debt is to decide to actually do it. 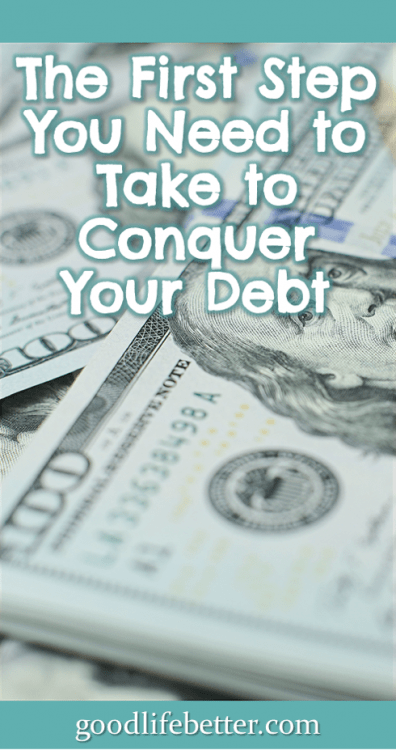 Someone who decides to get out of debt will be willing to take stock of what they owe, to rethink what they earn, and to sacrifice most of the extras for a specific period of time so that they can get rid of their debt for good. I know this because it is the first step I had to take in conquering my debt. 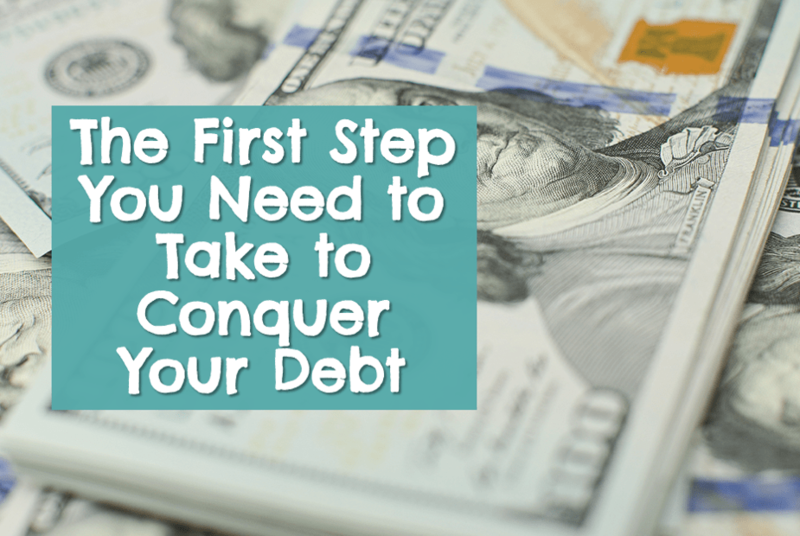 The very first step you need to take to conquer your debt is to decide to actually do it. I cannot recall a single moment in my adult life when I didn’t have at least some debt. Like a lot of people, I got my first credit card in college and also like a lot of people, I wasn’t always smart about using it. Low limits and fear kept me from getting into too much trouble, but the balances were always there, always accruing interest. I never missed a payment but there were months when the minimum was all I could muster. I would whine to my friends over dinners I couldn’t afford, and feel guilty when I charged a new outfit or pair of shoes, but I didn’t actually change my spending habits. I remember on at least two occasions taking out a loan on my already-paid-for-car so I could pay them off “once and for all” but both times I just ended up with a car loan and credit card debt. And then there were my student loans! These were “good debt” so as long as I could make the minimum expected payments I could just ignore them, right? Yes—if I didn’t mind paying almost as much in interest over the life of the loan as I had borrowed in the first place. When I finished law school in May 2011, I owed around $38,500 in graduate student loans with an interest rate of 6.55%. After making payments on these loans for over two years, in March 2014 my student loan balance was $37,100. After paying several hundred dollars a month for 28 months, I had paid off only $1,400 in principle. That’s nuts! For many years, I blamed my debt on the fact that I didn’t make a lot of money. Of course I was destined to have debt—who could live on how little I was making? The problem was that even as my income steadily increased, my debt never went away. In fact, it almost became easier to maintain balances because I could finagle better deals on the debt I had by refinancing my student loans or using balance transfer offers from credit cards to “save” on interest. All this changed in December 2017, when I set as a goal moving to a new city, one with a high cost of living, by Summer of 2018. I knew that my life there would be so much better if all those monthly drains on my salary were gone—no car payment, no credit cards, no student loans, no home equity loan. Not having debt would give me flexibility to take a job that paid less but was more rewarding than my current job, or to take a position with a start-up that could become the next big thing. Having no debt would also simplify my housing search, giving me the option of living someplace that might be more expensive but that offered benefits like a shorter commute or transit access. For the first time, I had a goal that meant more to me than all the stuff I could spend my money on—travel, new clothes, dinners out—and because of that, I decided to conquer my debt. And I have. In the first eight months alone I paid off over $34,000 in debt. Here is how I did it. I took stock of all my debt and prioritized what I would tackle first. I had four buckets of debt totaling around $60,000: two credit cards, a car loan, a home equity loan, and my student loans. I decided to pay off the credit cards, car loan, and home equity loan first so that by the time I was able to throw everything at my student loan, I would be making payments of around $2,500 a month. How cool would that be, to pay off in one month more than I had paid off in the first 28 months of making payments? I evaluated my spending and got rid of everything extra. The $117 per month gym? Exchanged for a $15 per month gym. Hulu? Never watched it so stopped paying $11 a month. I even renewed my library card and started checking out the books I wanted to read instead of mindlessly buying them on Amazon. My biggest savings, however, came from cutting back on eating out. Wow—what a difference eating most meals at home has made. And I rarely even drink! Altogether, cutting back resulted in another $900 a month toward debt. I searched for any additional pots of money I could throw at my debt. Easy sources were my tax return and any bonuses that came my way. I also boosted my efforts to earn money through my side hustle. My goal in doing this was not to create another source of income—I’m only in my second year of operations and had not planned on taking a salary just yet as I build up a reserve—but to ensure it could continue to operate without additional personal investments. Finally, I withdrew $15,0000 from my “emergency fund” which was really contributions I had made to a Roth IRA that I could access without any tax consequences. I know some of you reading this will think this was a bad move; it was definitely not something I did without a lot of thought. In the end, however, I decided that I am a better investment than the mutual fund it was in, and the returns the next phase of my life will produce will more than beat the market. I don’t want to give you the idea that everything has been easy and the desires to shop or eat out have evaporated. Even having decided to conquer debt, I more than once have looked at the calendar and thought how time seems to have slowed. One thing that has helped is monitoring my progress. Seeing those balances fall has been cause for much celebration. I also got a little thrill upon receiving the clean title to my car, and the paperwork showing that the lien on my condo for the home equity loan had been removed. As I continue to progress, I will write about it so that you can celebrate my victories with me. Let me know about your successes so I can celebrate yours with you!